I'd say it's not fair, but it is, quite literally. I'm out of town for what may very well be my very college football confluence. 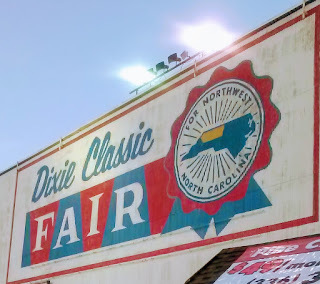 There's usually one Wake Forest game each year - two, if they're lucky, which falls during the Dixie Classic Fair. The Dixie Classic is sort of State Fair lite - not as daunting as the main event in Raleigh, but still an all around good time. The Dixie Classic Fairgrounds sit adjacent to BB&T Field, so if you catch it on one of those games, the pairing is amazing. I've gotten to fairgate in previous years, and if I weren't headed out of town this weekend, I'd certainly be back. This year ups the ante for my particular interests significantly. Wake is playing the highest ranked team that will visit this season (though it's notable that this year's home slate also included Notre Dame. Hope they're making bank at BB&T) in the #4 Clemson Tigers. What's more, the Band that Shakes the Southland is also making the trip. Add that two bands will be packed into the smallest stadium in the Power 5, and one could frankly enjoy the experience without spending the $51 that the game is up to now on the secondary market. Somebody get to Winston, getchua corn dog, and pour one out for the homies that ain't there - like me.